The Salmon House is impressive inside and out. Even the name is somehow endearing and traditional, as is the stone exterior and pastel green front door. This is a home which forces you to pause as you turn the key in the lock, if only to admire the Moray Firth at sunset. 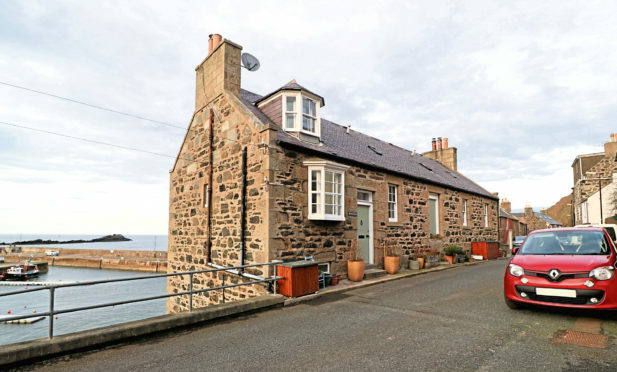 The property is positioned so as to bask in westerly light and, although The Salmon Cottage is Grade-B Listed, it has been sympathetically renovated. It features fire glass windows designed by glass artist Carrie Paxton, alongside original panels and wooden beams throughout. This is evident from the moment you step into the gorgeous lounge, where you’ll find an arched stone fireplace. The layout makes this room incredible versatile, and it is clearly the focal point of the home. It manages to be incredibly cosy despite the room’s size. There is plenty of space for dining furniture and the period features add to the sense of character. 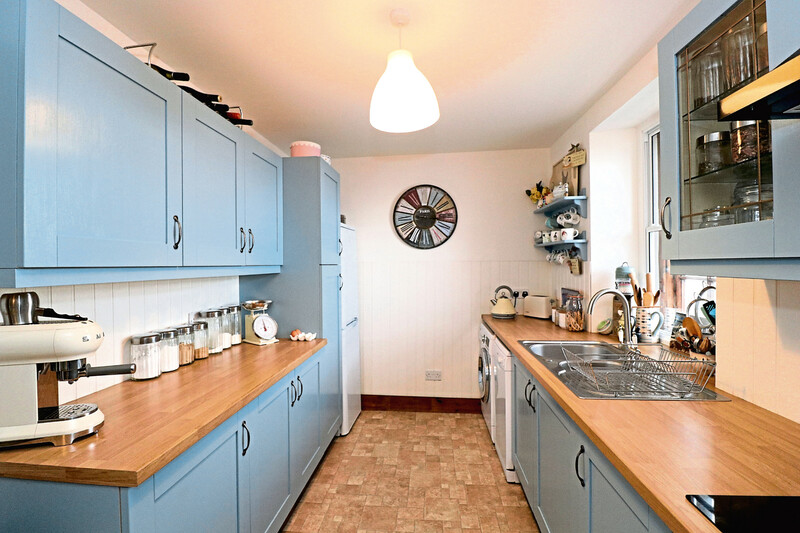 The dining kitchen has beautiful duck-egg blue cupboards and you’ll still be able to chat to guests as you cook. Drinks in front of the fire or fresh fish enjoyed at the dinner table – it is called The Salmon House after all. 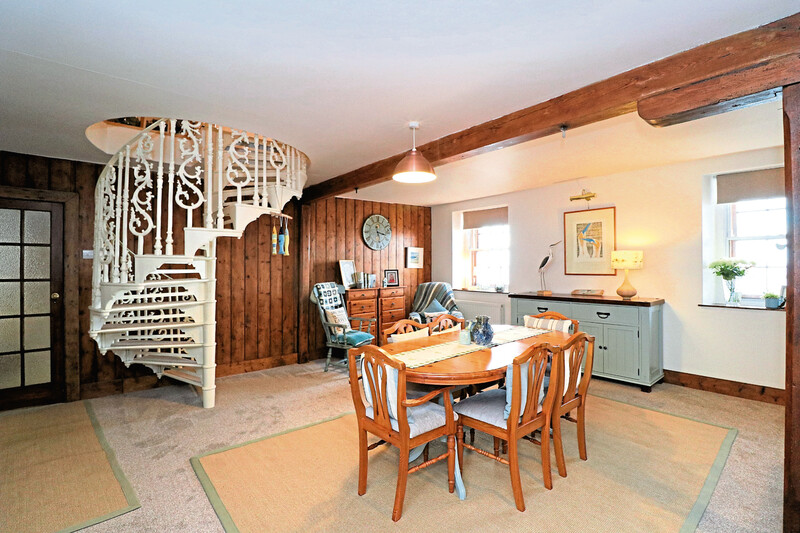 One bedroom can be found downstairs and would be ideal for visitors, while the remaining two bedrooms can be accessed via the beautiful spiral staircase. These rooms offer particularly stunning views across the harbour. Sloping ceilings add to the character and Velux windows enable plenty of light. There is ample storage space and unusual cupboards which are very much in keeping with the property. A bathroom and shower room complete the accommodation alongside a cloakroom. This lovely home is very much what you make of it and is calling on new owners who perhaps have a love of the sea. Banff itself is a busy town which has retained its sense of history, and there are plenty of amenities including a primary and secondary school. 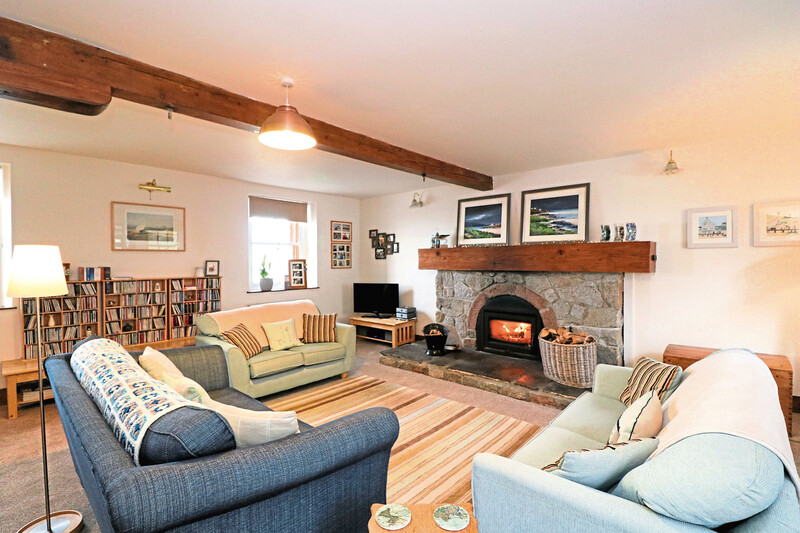 If you’d like to live up to this property’s namesake, you can indulge in salmon fishing on the River Deveron. Aberdeen is within reasonable commuting distance for those who work in the city, and the tranquillity of The Salmon Cottage will always be waiting after a busy day at work. Offers should be made of more than £190,000. Contact Aberdein Considine on 01467 21263.